Another reason to wish I were in London this summer: Selfridges (aka The Other Mothership) will host Charlotte Tilbury’s House of Rock’n’Kohl, a week long beauty event ( June 17 to 23) that will include makeovers, beauty advice and panel discussions with a variety of figures, as well as makeup bag clear-out sessions. This is an interesting event not just because Charlotte Tilbury is one of the biggest names in makeup artistry (are you following her YouTube channel? ), but due to the fact that this isn't a brand/product-driven affair. The focus is supposed to be looking at beauty at a social and cultural context (I'm curious what that means to Selfridges). There are some celebrities and visual artists expected appearances and a light installation portrait of Kate Moss will be unveiled in one of the store’s windows. If you're in London the week of June 17 to 23 will you be going? I'm very curious about this event and would love to hear opinions and impressions. Photo of Charlotte Tilbury at Milan S/S 2013 Fashion Week last September via contessanally.blogspot.com. 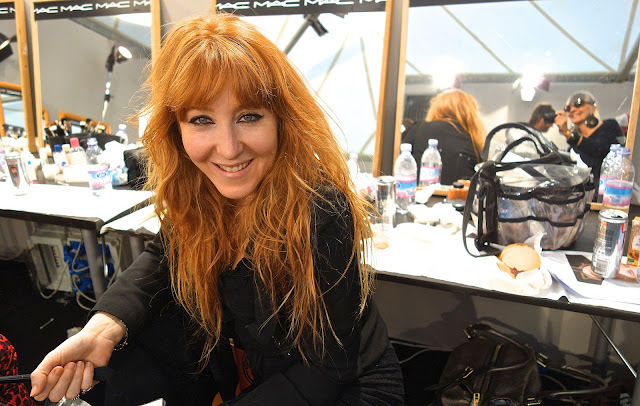 Info about Charlotte Tilbury’s House of Rock’n’Kohl At Selfridges via WWD.